A solar generator is the marketing term for an all-in-one solar component package that can be charged via solar panels. There are several different models on the market, but they are all fairly similar in function. They all, typically, include some kind of battery, solar charge controller, inverter, USB plugs, 110v plugs, battery monitor, and a way to charge the unit by solar panels, 12v car outlet, and/or a 110v wall plug. These components are all wrapped up into a nice, portable package. 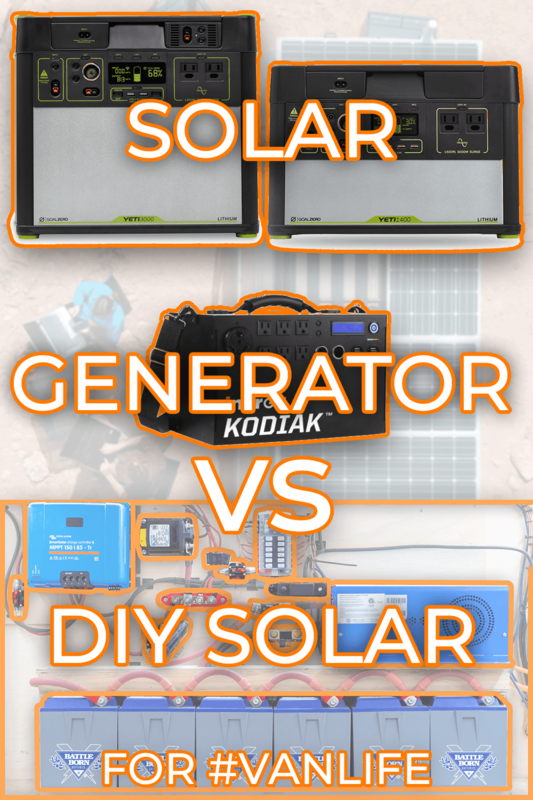 For this particular blog post, we are going to be comparing the Goal Zero Yeti 1400, Goal Zero Yeti 3000, Inergy Kodiak, and a DIY Camper Solar Setup. The two Goal Zero units we will be talking about in this blog post are the Yeti 1400 and the Yeti 3000. They are Goal Zero’s most powerful units. They both have lithium batteries and a similar set of component stats. The main difference is the size of the battery. 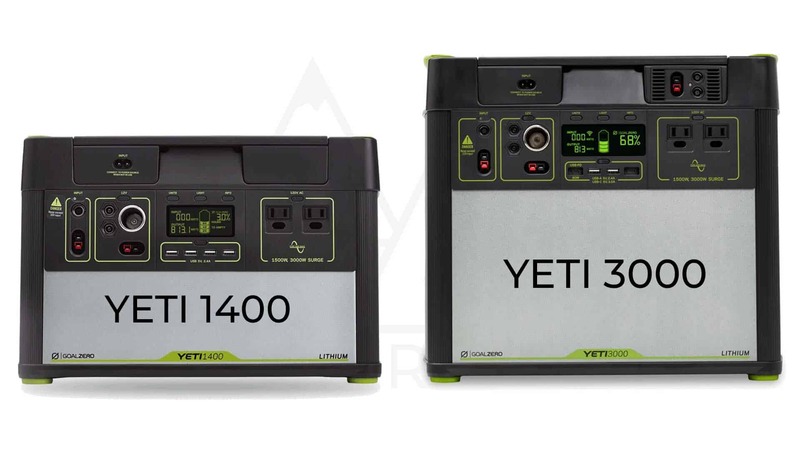 The Yeti 1400 has a battery capacity of 113 aH and the 3000 has a battery Capacity of 244 amp hours (@12.6v). Neither unit has a 12v car charging natively built in as of the making of this blog post BUT a workaround would be to purchase a small inverter to charge with… but we will talk about that in a minute. Both units can charge from the wall at a rate of 10 amps. The included charging cord will charge at 5 amps DC, but the Goal Zero Yeti units can charge using dual 110v charging cords at a combined rate of 10 amps DC. To fully charge the battery in the Goal Zero Yeti 3000 or 1400 units from a 110v plugin would take 25 hours or 12.5 hours, respectively. So, back to the alternator charging. Buying an additional, 300 watt plug-in inverter capable of supplying the 10 amps DC to the goal is pretty straightforward in hardware. Since either unit is capable of charging via a 110v plug in at 10 amps, it would take 25 or 12.5 hours of driving OR being plugged into shore power (a wall or campground power pedistal) to recharge a fully depleted unit. Goal Zero Yeti can charge at a max of a combined 480w of solar panels. Recently, they released an MPPT solar controller add-on, which makes the units charge even faster via solar. This comes pre-installed on the Yeti 3000 and would need to be purchased separately for the Yeti 1400. For the rest of this blog post, the stats and figures assume you’ve purchased and installed the MPPT add-on to the Yeti 1400. Both Units can charge at a max of 480 watts, but, the solar wiring setup is a little, funky… They have to be wired as a 360-watt group and 120-watt group. 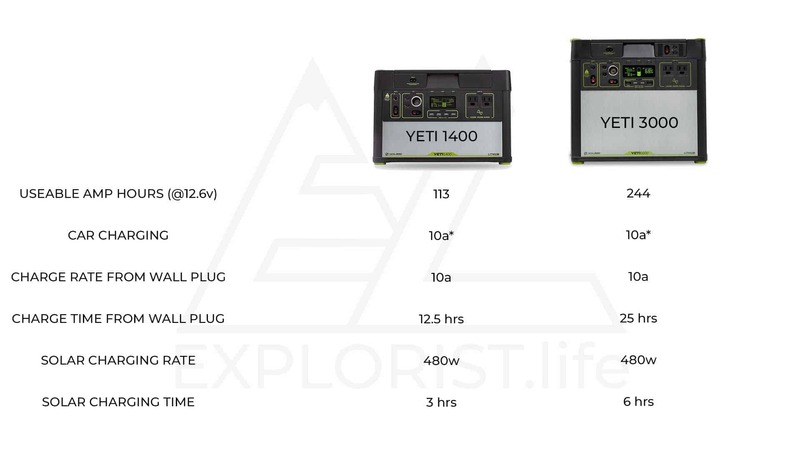 If wired to maximum solar capacity, the Yeti 1400 and 3000 would charge in as little as 3 hours and 6 hours, respectively. Interactive Picture: Click component images above for more info. There is only one model of Kodiak unit. It has a 90 amp hour lithium (@ 12.6v) battery. It can charge at a rate of 19 amps from a normal household plug which would charge the unit in about 11 hours. The unit can charge via 12v car charger at a rate of 19A DC, which will charge a completely depleted unit in about 5 hours. It can charge via solar through it’s PWM charge controller with a maximum input of 600 watts which would charge a depleted battery in as little as 2.5 hours. The Kodiak unit is unique because additional batteries can be added. It’s worth noting; external lithium batteries are NOT able to be connected to this unit, so AGM will be your only good option. 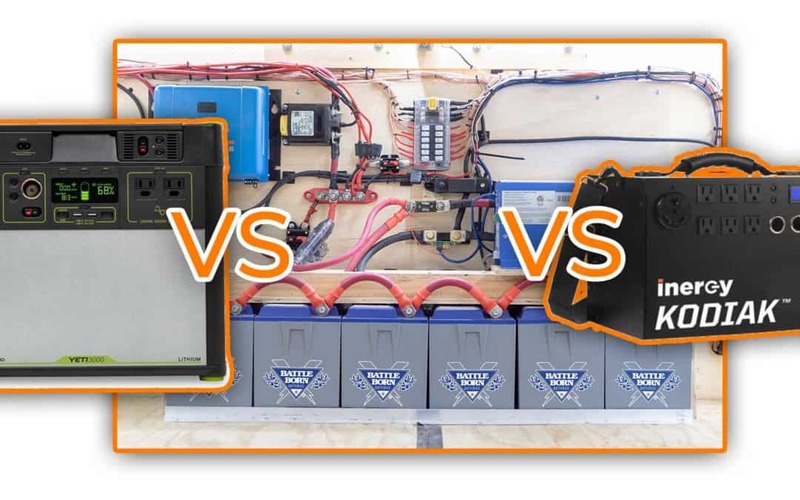 If you add one more 100aH AGM battery to add yet ANOTHER 50aH of usable battery, to a total of 190 useable amp hours, your charging time would increase to 22 hours via a 110v wall outlet, 10 hours of driving, or 5 hours from 600w of solar. Now, we’ve talked about the individual specs and differences of each unit, but here’s how the Goal Zero Yeti 1400, 3000 and the Kodiak are the same. They all have pure sine inverters with a continuous rating of 1500 watts and surge ratings of 3000 watts. This means they can run MOST of your 110v household appliances like a coffee maker, instant pot, or even an induction cooktop given you’ve got adequate battery power remaining. Both units are quality units. Although we don’t personally use them in our van, we’ve had plenty of hands-on with them to say they are all good quality in regards to construction. They are EASY! Once you decide this is the direction you’re going to go, it’s so simple to get up and running. There are only a few external connections you need to make and you don’t have to learn near as much about solar as you would in a DIY system. On the Goal Zero Units, I HATE that we’ve got to jump through hoops to wire up the maximum 480 watts of solar. Wiring through, I’m assuming, two internal charge controllers forcing us to use a 120-watt solar panel AND a 360-watt panel array, which would be something like two, 175-watt panels rather than simply letting us use whatever size we want to get to 480 watts. oh… and 480 watts? Why not 500 watts so we could use 5 commonly available 100-watt solar panels. I hate that the Kodiak only has a PWM charge controller. It’s an outdated technology which will force you to use more solar panels to get similar output from them in regards to DIY or even the Goal Zero unit. The ease of design in these units, by nature, makes them less modular and less expandable than their DIY Counterpart. WHICH ONE? GOAL ZERO YETI OR INERGY KODIAK? So, now, we are actually comparing two ‘groups’ of products. 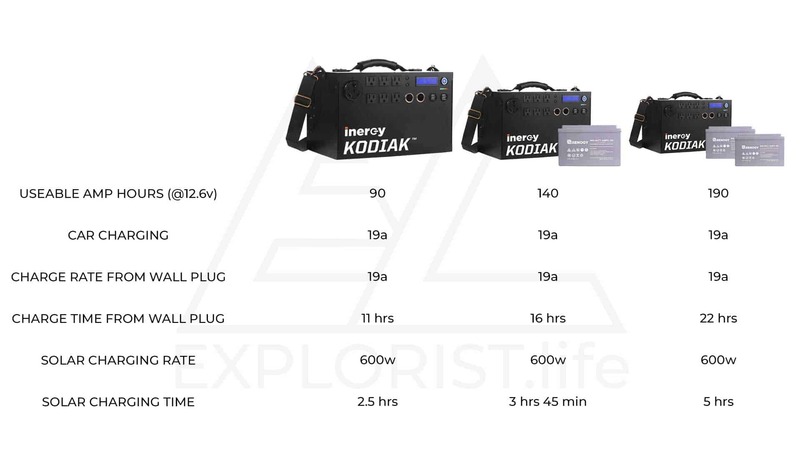 The Yeti 1400 vs the Kodiak and the Yeti 3000 vs the Kodiak + additional batteries. Comparing the Yeti 1400 and the Yeti 3000 isn’t a logical comparison as the only difference (after my recommended accessories) is the battery size. You really need to do a power audit to determine how many amp hours YOU will use throughout the day. THAT number will give you a better idea on if the Yeti 1400 or Kodiak 3000 is right for you. The Goal Zero 1400 and the Kodiak unit are fairly comparable in terms of price and performance. If I had a need for a 100ish amp hour battery unit like either of those two, I think I’d personally overlook the less-than-ideal alternator charging ability and go with the Goal Zero unit. The 600 watt capacity of the Kodiak unit is attractive, but the lack of MPPT charger makes the added solar capacity a bit of a wash. Also, Yeti 1400 has a slightly bigger battery as well. If I needed more battery capacity, I’d be going for the Goal Zero over the Kodiak plus added external AGM batteries. We’ve already done a thorough discussion on AGM vs Lithium batteries, so I don’t need to go over that again. If it were possible to add external Lithium batteries to the Kodiak unit, perhaps it’d be another toss-up, but cornering me into an AGM corner for added external batteries tilts the scale toward the bigger, Goal Zero unit. 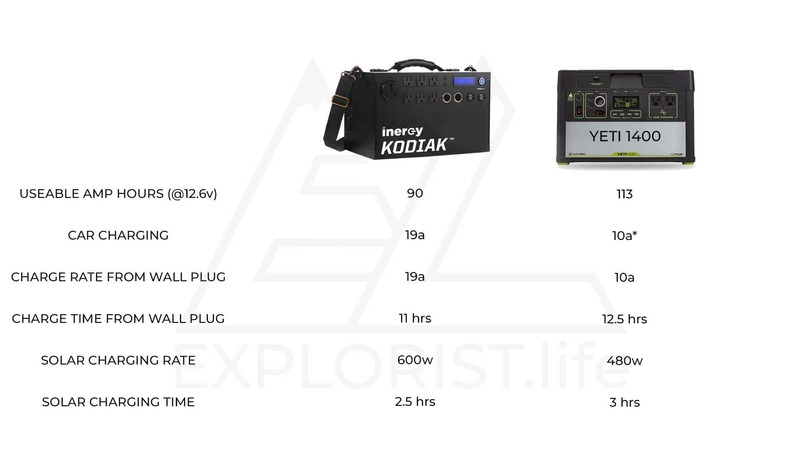 But… BUT If I were fine with AGM, I’d need 300 amp hours of AGM batteries to get the additional 150 useable amp hours to make the Kodiak’s battery storage capacity on par with the Yeti 3000. 3 x 100aH Renogy AGM batteries would be about $600. That’d put the Kodiak + extra batteries at… nearly the same price as the Goal Zero Yeti 3000… so I’d still go with the Yeti 3000. So, although a tight race between the units I still recommend either of the Goal Zero Yeti Units over the Kodiak unit, in general. In the past, I thought a DIY solar system for your campervan was the best, most cost-effective way to do things. Now, I know that’s not necessarily ‘always' the case. Keep reading all the way to the end, and I'll give you some actionable steps to find out which is right for you. Infinitely customizable. Want a 300 amp hour battery bank? Perfect! 3000? Cool! How about 800 watts of solar? No problem. Add a 2nd charge controller and ramp up to 2000 watts of solar? Sweet! Let’s do it. All of the individual components in a DIY setup are up for swapping out with components that fit YOUR needs. The Goal Zero tops out at 240 amp hours of battery. There is no upper end to DIY. Goal Zero tops out at 480 watts of solar. There is no upper end to DIY. The Goal Zero Yeti 3000 takes 25 hours to charge it’s fully depleted 240 amp hour battery from a wall outlet or driving, whereas a DIY solution would only take about 3-4 hours. Warranty: Goal Zero Units have a 1-year warranty. DIY solutions obviously depend GREATLY on the components used, but Battle Born lithium batteries offer a 10-year warranty. Victron, who makes charge controllers, inverters, and many other components have a 5-year warranty. Solar Knowledge. Simply by installing solar yourself, you’ll have a greater understanding of how your electrical system in your camper works and how all the parts work together. DIY is Less bang for your buck in a sub 200 amp hour system. More time spent assembling desired parts. Most time spent picking out parts and figuring out wiring diagrams. 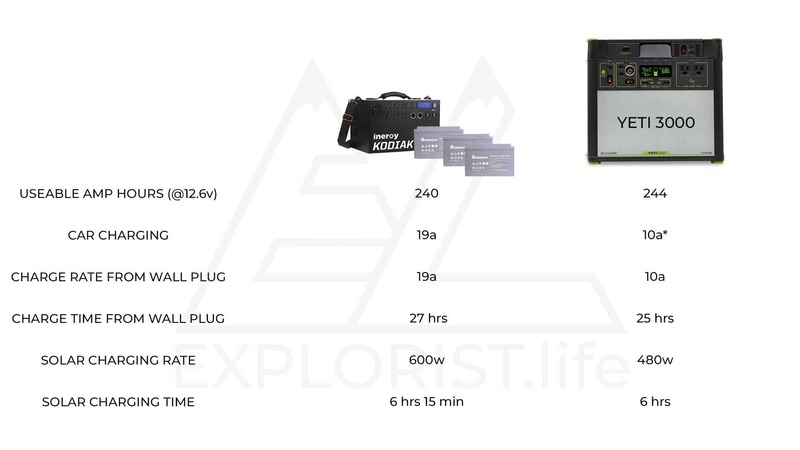 If we were to build a DIY setup similar to the Goal Zero Yeti 1400, I’d need a 50 amp charge controller, an Inverter/Charger, a 100aH Lithium Battery. Just with those parts, we’ve already racked up a hardware bill similar to the price of a Goal Zero Yeti 1400. 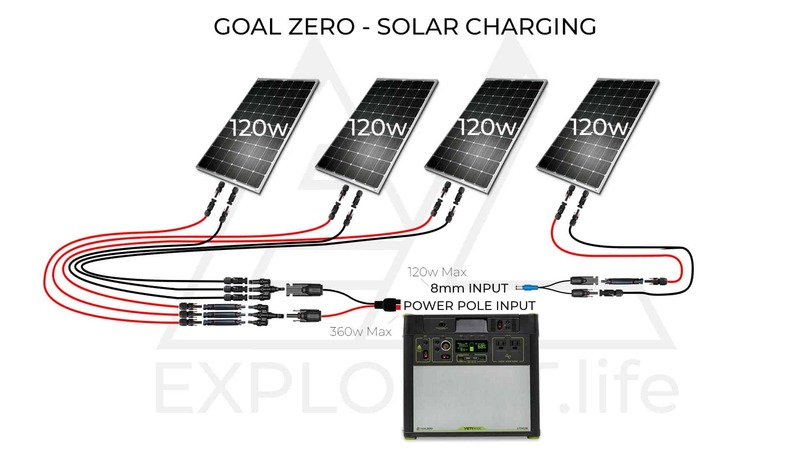 If we were to build a DIY setup similar to the Goal Zero Yeti 3000, I’d need a 50 amp charge controller, an Inverter/Charger, 2 x 100aH Lithium Batteries. With those parts, we are already at the same price point as the Goal Zero Yeti 3000. What I’m trying to say is… the DIY solution is not more cost effective than the Goal Zero Yeti Units for comparably sized systems under 200 amp hours. Now, that example is sizing your system according to your budget, which is fine… but it’s a REALLY good idea to size your system according to your actual power usage. That’s why you need to do a power audit. If your power audit comes back saying you’ll need less than 100 amp hours per day and you’ve got a hard budget of $1600 to accomplish your camper electrical goals, the Goal Zero Yeti 1400 is going to be the best bang for your buck. 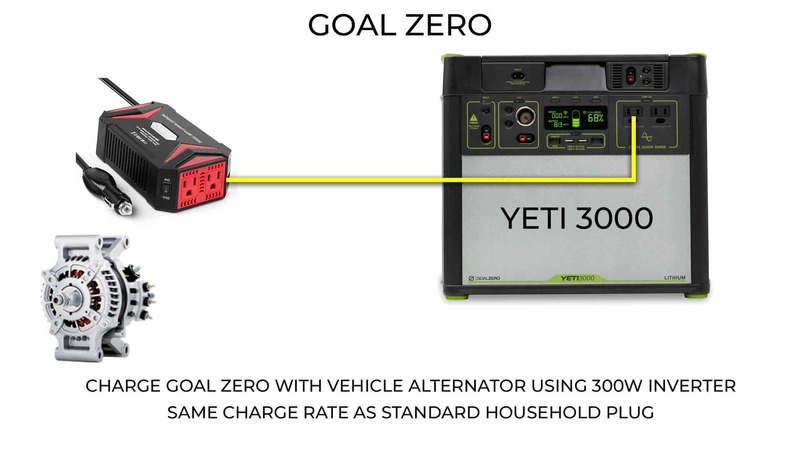 If your power audit comes back saying you’ll need less than 240 amp hours and you’ve got a hard budget of $2500 to accomplish your camper electrical goals, the Goal Zero Yeti 3000 is going to be the one for you. GOAL ZERO OR DIY SOLAR? Do you want 500+ watts of solar panels? Do you want more options on what solar panels you can use? Did your power audit recommend more than 240 amp hours? Is charging via the vehicle alternator a high priority? Is getting a full charge overnight a high priority? Do you want your system to be modular for future system expansions? Is the Budget for your Electrical system over $2500? If you answered YES to any/most/all of the first 6 questions and you answered YES to the last question, a DIY solution is going to suit you much better. If you had mainly NO’s in your responses, a Goal Zero Yeti 1400 or Goal Zero Yeti 3000 is going to be a better option. I hope you found this post helpful and if you’ve got any further questions, drop them in the comments section below. Think somebody could benefit from this post? We’d love it if you’d share it with them. 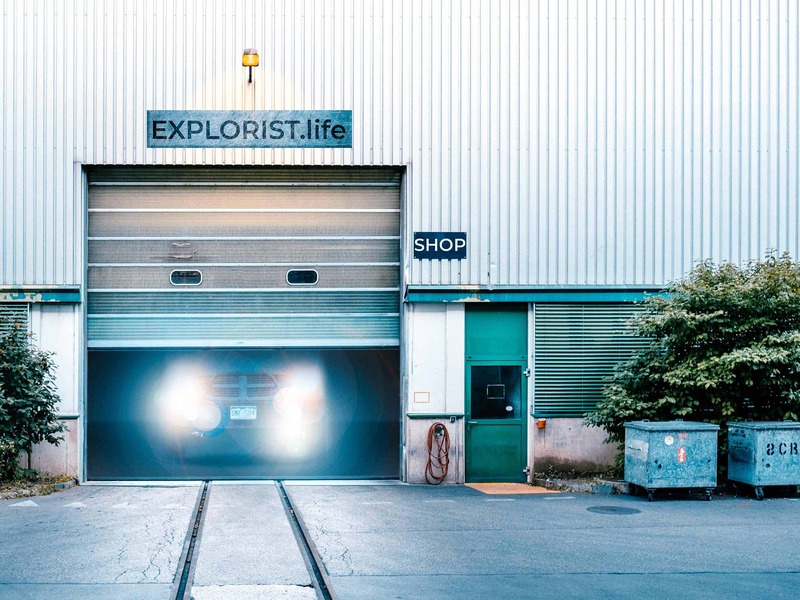 If you’re not already, consider subscribing to our newsletter for more DIY Camper Van, Adventure, and general life-behind-the-scenes updates. Thanks for the write up! We bought a smaller Goal Zero Yeti a few years back and have been very happy with it. We don't use it often, but it is very handy when we do use it. ‘A full charge overnight' is in regards to plugging into a wall or campground power pedestal if your power consumption is greater than your solar generation. Yes, Charging at 60 amps is 6x faster than charging at 10 amps. It would take 20 hours to charge 200 amp hours at 10 amps. It would take less than 4 hours to charge 200 amp hours at 60 amps.